TUCSON, ARIZONA — Pacific Acquisitions, LLC an affiliate of Bond Commercial Properties purchased a 57,000-square-foot industrial building from Davis Selected Advisors located at 3601 East Britannia Drive in Tucson Arizona for $12.45 million ($218. PSF). The property was fully occupied by a defense related tenant and sold in for investment. The investor is based in Anchorage, Alaska. Bond Commercial Properties, acquires, sells, and manages commercial real estate properties in Alaska, Arizona, New Mexico, Nevada, and Utah. The company manages various commercial properties, including warehouses, secure facilities, office buildings, and land leases for government and private corporations. It also guides customers in selling or purchasing commercial properties. 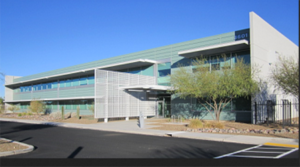 This was the third acquisition for the investor in the Tucson market. Jesse Blum, Senior Associate, of CBRE’s Tucson office and Bill Divito, who passed away recently before the closing, represented the seller in the transaction. For more information, Blum should be reached at 520.321.3335. To learn more, see RED Comp #6498.